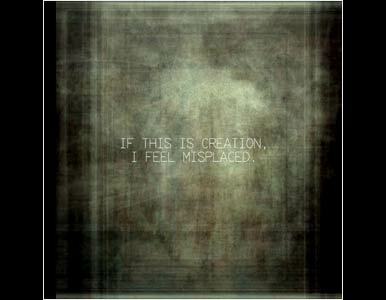 Inhale | If This Is Creation, I Feel Misplaced. IF THIS IS CREATION, I FEEL MISPLACED. BEING A NUMBERS PERSON, I REALIZED I COULDNT STOP WITH TWELVE CDS, SO THIS IS NUMBER THIRTEEN. IT'S A COLLAGE OF ALL EIGHTY-SIX TRACKS INHALE EVER DID, WHICH MAKES THIS EIGHTY-SEVEN, ANOTHER SIGNIFICANT NUMBER TO ME. I ALSO READ SOMETHING I WROTE UNDERNEATH ALL THE CACOPHONY, BUT I'LL NEVER TELL ANYONE WHAT THAT IS. THE COVER ART IS ALSO A COLLAGE OF IMAGES. I WON'T TELL ANYONE WHAT THAT IS EITHER.